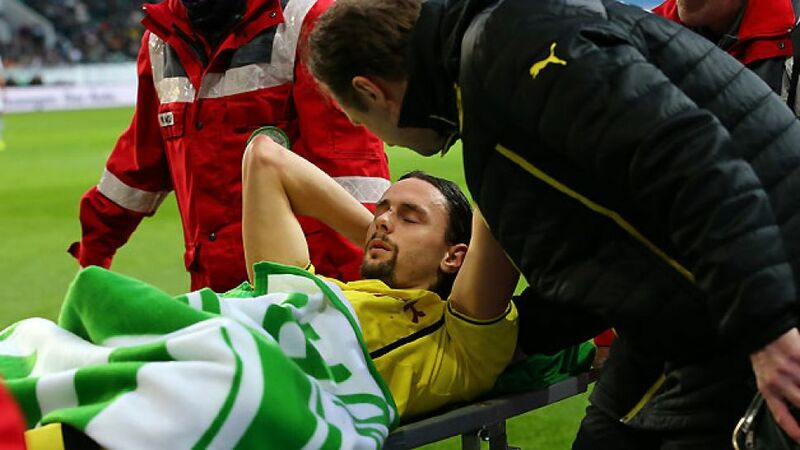 Dortmund’s injury woes: bad luck or warning sign? Munich - After trailing FC Bayern München by a whopping 25 points in the Bundesliga last season, Marco Reus vowed that Borussia Dortmund would not let the margin grow so big again, and thus they recruited heavily to bolster their ranks. Yet at the halfway stage in 2013/14, the Schwarz-Gelben are already 12 points behind the Bavarians, who still have a game in hand. So where has it all gone wrong domestically for Jürgen Klopp’s young charges? Wayward finishing has certainly played its part in Dortmund’s comparatively meagre points' haul, with several matches ending in a stalemate or defeat, despite Reus and Co. enjoying the lion’s share of scoring opportunities. The Matchday 8 tie away to Borussia Mönchengladbach is just one of many examples: the visitors returned home nursing a 2-0 reverse despite having 27 attempts on goal, to Gladbach’s 6. However, the astonishing number of injuries, many of them requiring lengthy recovery periods, to key first-team regulars has without doubt been a significant factor in Dortmund’s stuttering title tilt. Lukasz Piszczek, Neven Subotic, Mats Hummels, Marcel Schmelzer,Henrikh Mkhitaryan, Ilkay Gündogan, Nuri Sahin, Sven Bender, Sebastian Kehl and Jakub Blaszczykowski have all had time out this term, forcing Klopp to reshuffle. Yet that cannot be the whole story, as Bayern have also had to deal with absences to crucial players for long periods of the season too. Holger Badstuber is still working his way back from surgery, while Dante, Javi Martinez and Mario Götze all struggled with fitness early on in the campaign. On top of that, injury has sidelined Philipp Lahm, Bastian Schweinsteiger, Xherdan Shaqiri, Claudio Pizarro, Thiago, Franck Ribery and Arjen Robben at various points over the course of 2013/14. The depth of quality in Bayern’s squad is vital here, as Pep Guardiola can call on experienced internationals to fill in, while Dortmund’s substitutes’ bench is crammed with exciting but unproven young talent. Even so, scratch beneath the surface a little further and another reason becomes apparent. The strenuous physical demands of the modern game are well known, yet Klopp’s desire for an intense, high-pressing style exacts the last drops of energy from his players. Bayern may have played more competitive fixtures in the 2013 calendar year due to their progress in last season’s DFB Cup and the Club World Cup last month, but the Dortmund squad have covered more ground. And BVB players do not just run (covering an average of three kilometres more per game than their Bayern counterparts), they sprint. A lot. Given the extra effort and strain required to go flat out, the likelihood of picking up an injury becomes more probable. That may be also a consideration in Guardiola's preference for playing a less sapping, lower-impact possession-based style. Keep the ball, run less. Bayern’s passes have found their mark almost 87 per cent of the time in the Bundesliga so far this term, whereas Dortmund are forced to chase the ball more often, with only 76.4 per cent of their passes reaching the intended recipient. So what next for Dortmund? The winter break will help recharge the batteries, but if Klopp remains intent on sticking to his preferred system and wants to compete for various trophies in 2014, then well-established recruits will be required in order to maintain something more than a skeleton crew for the rest of the season. If not, the new year could witness some tactical adaptations at the Signal Iduna Park.